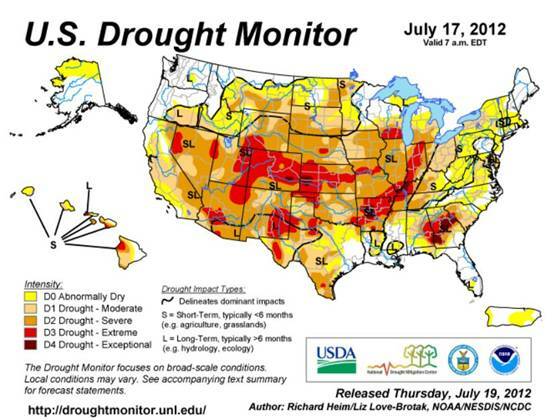 The United States Drought Monitor shows 88 percent of corn, and 87 percent of soybean crops are in drought-stricken regions. Adhesives, aluminum, aspirin, clothing starch, cosmetics, cough syrup, dry cell batteries, envelopes, fiberglass insulation, gelatin capsules, ink, insecticides, paint, penicillin, powders, rugs and carpets, stamps, sweetener’s, talcum, toothpaste, wallpaper, vitamins, processed and fast foods and of course as fuel - ethanol. Extreme heat and drought conditions hit the Midwest just as the corn crop was suppose to pollinate - the key yield determining growth phase for corn. Crop ratings have fallen to their lowest level in 24 years - the most recent estimate pegged the crop as just thirty-one percent of the U.S. corn crop in good or excellent condition as of July 15, the least for the date since 1988. The U.S. beef herd has shrunk to its smallest since 1956. "Feed costs account for about 40 to 50 percent of total costs of production, and when a rancher or poultry producer or dairy producer is faced with higher feed costs it's less profitable to produce that animal. Often times you will see animals brought to market before they reach full weight. 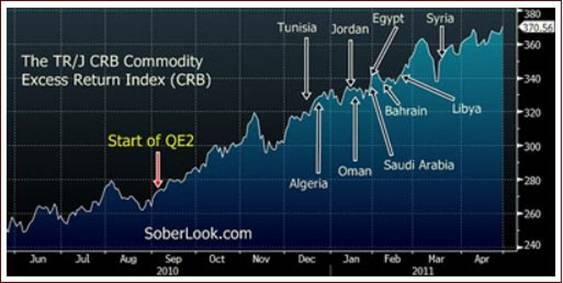 In dire cases, producers will liquidate the entire herd and don't expand as much as they might have." Joseph Glauber, chief economist at the U.S. Department of Agriculture. The drought in the Midwest comes on the heels of one last year in the southern Plains, the heart of Texas cattle country - the 11 months through August 2011 were the driest since at least 1895 in Texas. 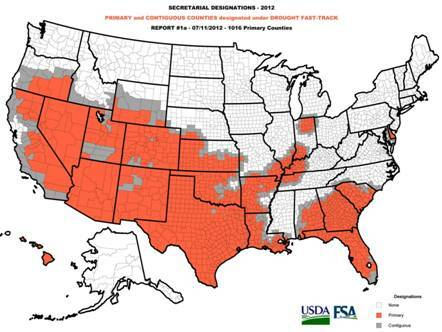 A record 54 percent of pasture and rangeland is in poor or very poor condition. The drought has destroyed a lot of pasture, and the lack of rain has hit hay and alfalfa production hard. Ranchers normally start feeding their animals hay in December or January (as cold temperatures kill the grass) and stop in late spring as grass becomes available in pastures. This year many ranchers haven’t stopped feeding hay because what grass was in their pastures withered. Ranchers are again selling off part of their herd. In the week ending June 30, 52,700 cows were slaughtered. That’s a three percent rise higher, year over year, then during the peak of the Plains drought. Farms are sending young cattle to feedlots earlier than normal and slaughtering more beef cows because pastures have no grass and hay prices have more than doubled. Corn prices are up so much feedlot margins are drastically reduced or non-existent, feedlots buy year-old animals that weigh 500 to 800 pounds - these young animals are called feeders. They are fattened on corn for four or five months until they weigh around 1,200 pounds, then they are sold to meatpackers. Fewer cows today means fewer beef and *dairy cattle tomorrow. Short term meat prices might drop because of the extra cattle (and hogs and **chickens) going into the meat market. Unfortunately when those cattle should have been sold there'll be no cattle to sell, so meat prices will go up, a lot, and stay that way for a considerable time, until the herds are rebuilt. *Expect dairy prices to skyrocket up, not only because part of the herd is being sold off but, if feed is of poor quality dairy production goes down, if there’s less milk given per cow and its of lower quality it will, for example, take more milk to make the same amount of cheese as from higher quality milk. ** Poultry meat and eggs will see the earliest price increases since these shorter lived birds are raised almost entirely on corn. The good news – the United Nations Food and Agriculture Organization’s (FAO) indices show that in June global food prices were down by 13 percent from their June 2011 peak and prices for cereals by 14.7 percent. 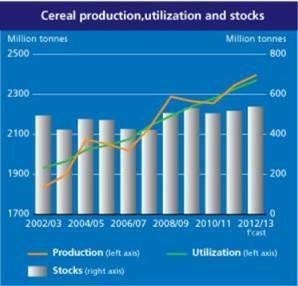 According to the FAO, global cereal output rose to 2.3 billion tonnes in 2011/12, a record. 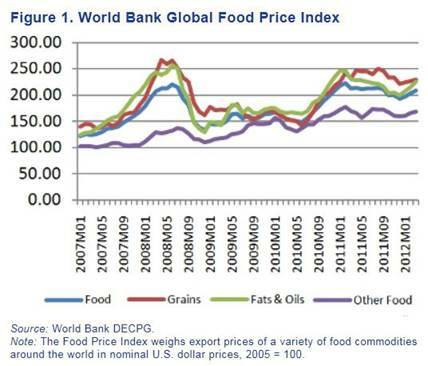 The bad news - food prices have more than doubled since 2003/4. 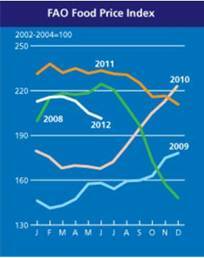 The FAO estimates that since 2004, world food prices, on average, have climbed 240% as average incomes have declined. “The forecast for world cereal production has been lowered from last month, which is likely to result in a smaller build-up of world inventories by the end of seasons in 2013 than previously anticipated. Frosts early in the year are responsible for the higher fruit and vegetable costs experienced by consumers. 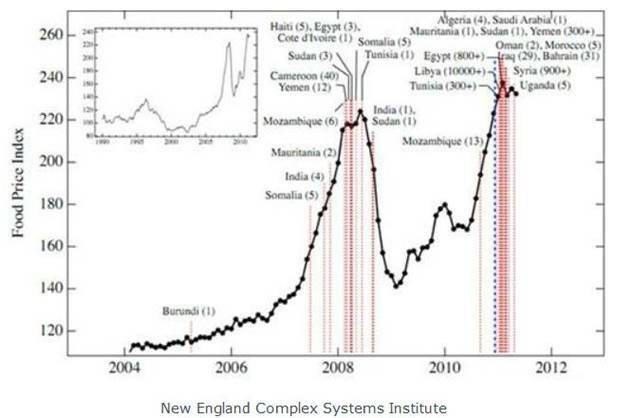 The increase in the price of food is the straw that breaks the camel’s back - the real cause of angst is the rising cost of living being felt in developing areas of the world. Many of these people, already living in poverty, and those on poverties edges, are far less capable of absorbing the increased costs of what is really just basic survival for themselves and their families. Yet this is the first group of people who are impacted by the coming unstoppable waves of inflation and real shortages - whether localized or temporary because of supply chain breakages or poor harvests. Hundreds of millions of marginalized people, people perhaps counted by the billions, across all nations, will feel the extreme pinch of increased prices, across all asset classes, on their household budgets. But especially so in what those people need the most – water, food and clothing – the bare essentials necessary for survival. The relief we’ve recently experienced from this food, or rather from this higher cost of survival driven social unrest - is very temporary, a calm before the storm. A shortage of fresh clean water for irrigation and drinking, fragile and easily disrupted food supply chains and extremely expensive (or non-existent) food, clothing and energy basics for emerging and developing nations is going to be the coming norm. And it’s going to cause chaos. A global currency race to worthless, inefficient supply chains, intensified weather phenomena and a race to secure dwindling supplies of commodities by developed economies (and their richer inhabitants) all mean the very basics of human survival will become increasingly scarce for the poorer people in the developing world. The US is the world’s largest producer of corn, soybeans, and wheat, accounting for one in every three tons of the grains traded globally - the US dominates the global corn market but the government has cut its projected corn harvest to the lowest yield since 2003 and Doan Advisory Services said the drought may lead to the smallest corn harvest since 2006. We’re one poor harvest away from a food supply catastrophe and a repeat of the food shortages that caused the Arab Spring. This fact should be on everyone’s radar screen. Is it on yours?